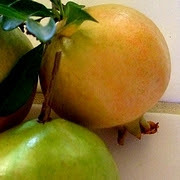 I already ran this video demo a long time ago, but when my mother sent me a photo of some “Sweetheart” pomegranates (below right), I thought it would be perfect timing to rerun this clip since this is pomegranate season. By the way, I had never seen a non-red pomegranate before, but she reports the insides are as red and delicious as the traditional varieties. This is a short, but hopefully useful demo for how to remove all those pomegranate kernels without making a big mess. These are great on any fall/winter salads or soups, and of course desserts. 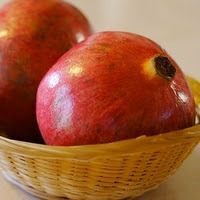 what i do is cut them in half and over a bowl turn the cut half down and with a wooden handle or even a hammer i bang on the pomegranate and the seeds fall out easily. Chef John, do you swallow the seeds and all? Hi,So glad I linked to your site from tastespotting this morning before I got my pomegranate cleaned and ready for my vanilla yogurt for breakfast. It was so easy. Hard to believe I had my first pomegranate this September while camping in Arizona. There was a pomegranate tree near the pool and they were outstanding. Have not been that lucky with grocery store purchases here in Connecticut. Also had a great flank steak at home last night and will be sure to try your marinade next time with the garlic, black pepper and fennel seeds. yes,you eat the whole kernel which explodes with juice in your mouth and leaves a very tiny seed which is good for you. Oh, this is great. They should come with these instructions. I've eaten pomegranates before, but I think they're a lot of labor for a little bit of fruit. I make dark chocolate covered pomegranate seed clusters for autumn every year. Just be sure to dry the seeds before adding them to the melted chocolate or you risk freezing your chocolate. I take apart about 20lbs of them a year (mainly on the jewish holiday of sukkot). I found that the easiest way is to use a wooden spoon to hardly tap them (when they are still whole) and then cut in half, and tap from the outside with the exposed part over a WET towel (it keeps the moisture). My sister and I have been eating pomegranate for years every sincewe were kids in the 80s. We would ring them to lunch and our friends would ask what they were. I never thought they would be a food craze now. And I still love them! !